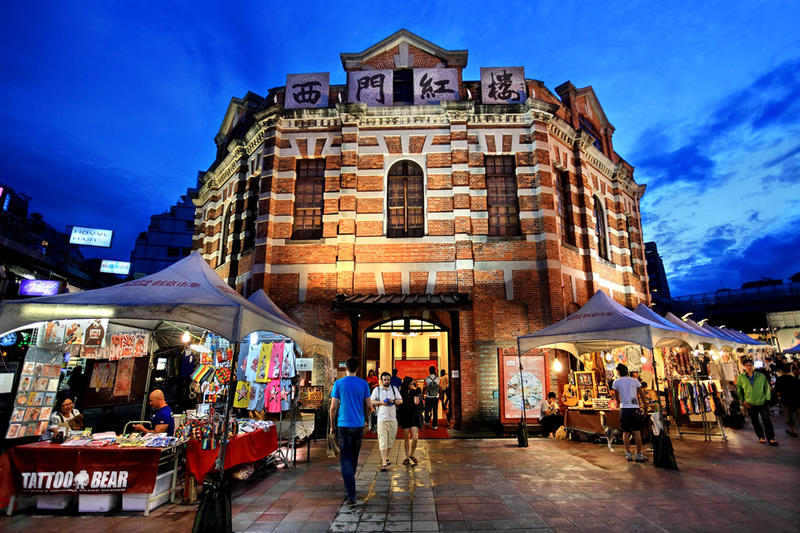 The Red House, a Western-style red-brick octagonal structure in Taipei's Ximen space built in 1908, is Taiwan's first public market and the most well preserved historical site. Designed by Kondo Juro, a western-styled architect in the prefectural civil engineering office at the time, the market entrance, incorporating both octagonal and cruciform shapes, was paralleled by no other in the east and west. The market entrance also took on the "eight trigrams (bagua)" design considered boldly creative then. Octagon Building, Cruciform Building, and the adjacent South-North Square are now collectively known as the Red House. In November, 2007, Department of Cultural Affairs commissioned Taipei Culture Foundation to manage The Red House. It underwent a series of cultural transformation including: at Octagon Building 2F Theater, Central Display Area, Grid of Hundred Treasures, Cho West Cha, The Red House Boutique Area, at Cruciform Building 16 Workshops, Cultural Arts Exhibition Platform, Riverside Live House, Market for Artists & Designers located and Moonlight Movie Theater by North Square and Outdoor Café located by South Square. These changes provided better services to the general public, created a space of creativity, attracted crowds, and expanded the domain of overlapping cultural arts. The Red House has successfully transformed into a new cultural & creative industries development center in Taipei City. In 2008, it was awarded The 7th Urban Landscape Award in Historical Space Redevelopment Category. Nat'l Hwy 1 → Exit at the Yuan Mountain (Yanshan) Interchange → Jianguo N. Rd. → Jianguo S. Rd., Sec. 1 → Zhongxiao E. Rd., Sec. 3 → Zhongxiao W. Rd., Sec. 1 → Zhonghua Rd. → Chengdu Rd. Nat'l Hwy 3 → Exit at the Zhonghe Interchange → Prov. Hwy 64 → Wenhua Rd., Sec. 2 → Huajiang Bridge → Heping W. Rd., Sec 3 → Nanning Rd. → Zhonghua Rd., Sec. 2 to Sec. 1 → Chengdu Rd. Take the THSR to Taipei Station, continue by MRT to Ximen Station. Take the train to Taipei Railway Station, continue by MRT to Ximen Station.